Another exciting project is now complete… I was so honored when Lion Brand Yarn asked me to host their Summer 2015 Crochet Along!! In 5 weeks we made the Sabrina Tunic and I am so happy with the way mine turned out!! What do you think?? I hope you will hop over and read my blog post on Lion Brand Yarns site to read all about my Week 5 The Finishing Touches!! Crochet Alongs are a great way to make a project with out getting overwhelmed!! 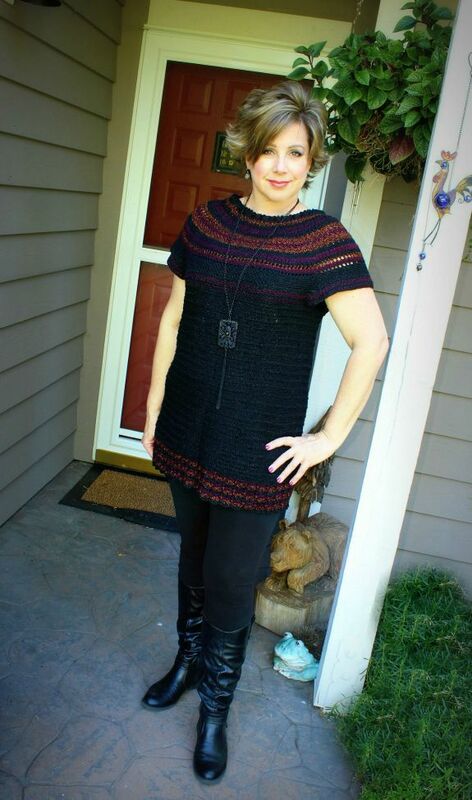 Now I have a fun Fall tunic to wear and believe me… This is one crochet garment I will be wearing many times!! Stay tuned for my Amazing Grace Summer Shawl Pattern in the next few days!! I have missed out on the “weekly” instructions on the gorgeous tunic. Is there a place I can get the complete pattern so I can start my own tunic?